There’s a hole in my sweater; darn it! Why yes, I did. I didn’t have exactly the same color, but this is reasonably close. I duplicate stitched over the adjacent stitches and the one broken stitch. I think it looks pretty decent. 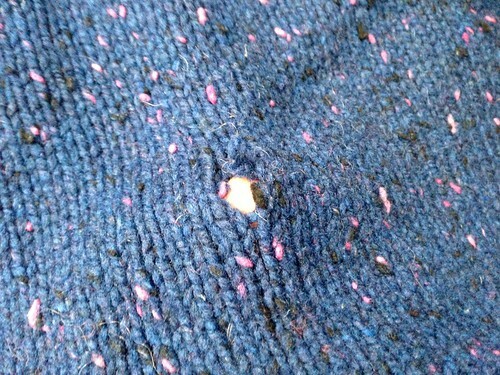 This post is for Deborah, who was asking about repairing holes in knitting. Now if only someone could repair the hole in our hearts, after the local shopping mall shootings, and the kindergarten shootings in Connecticut. So sad. 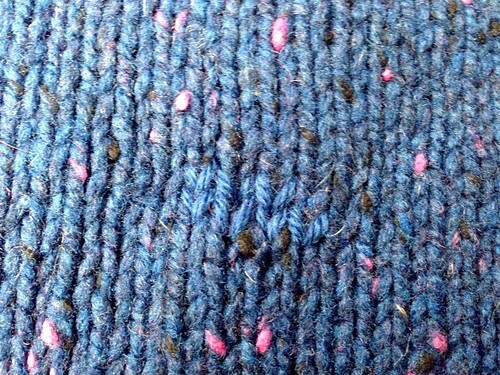 This entry was posted in Knit and tagged darning, repair. Bookmark the permalink. It is so frustrating that these types of massacres continue. So sad for the families involved. Great job. And I love the title!